We would be lying if we’d say the world is as it always was, but we cannot. Have we ever had in our day and age such massive fires out of control, tornadoes leveling communities along with earthquakes and floods ALL AT THE SAME TIME in the earth? To say Gods hand is not in the weather is to deny who He truly is! 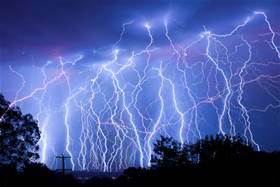 Does not scripture teach us thunder is Gods voice and lightning is His arm. (Isaiah 30:30). God has reserved in His treasury snow and even hail against the day of battle and war. (Job 38:22-25) Hast thou entered into the treasures of the snow? or hast thou seen the treasures of the hail, Which I have reserved against the time of trouble, against the day of battle and war? By what way is the light parted, which scattereth the east wind upon the earth? Who hath divided a watercourse for the overflowing of waters, or a way for the lightning of thunder;…. (Job 37:1-13…..Job 40:9)…. (7th and final vial of God’s wrath poured out Revelation 16:17-21). The weather has always been from the hand of God, and He can even tell when He’ll bring to pass any rain,hail,or even pestilence as we see in Exodus when the Lord told Moses to tell Phar’-aoh where He even pin points the time by saying “Tomorrow about this time I will cause it to rain a very grievous hail, such as hath not been in Egypt since the foundation thereof even until now” (Exodus 9:18).God makes sure Phar’-aoh knows if he won’t let His people go so they can serve Him then He will come to know there is no one like Him in the earth! (Exodus 9:13-18). And the Lord said unto Moses, Rise up early in the morning, and stand before Pharaoh, and say unto him, Thus saith the Lord God of the Hebrews, Let my people go, that they may serve me. For I will at this time send all my plagues upon thine heart, and upon thy servants, and upon thy people; that thou mayest know that there is none like me in all the earth. For now I will stretch out my hand, that I may smite thee and thy people with pestilence; and thou shalt be cut off from the earth. And in very deed for this cause have I raised thee up, for to shew in thee my power; and that my name may be declared throughout all the earth.As yet exaltest thou thyself against my people, that thou wilt not let them go? Behold, to morrow about this time I will cause it to rain a very grievous hail, such as hath not been in Egypt since the foundation thereof even until now. As Christians we are told not to fear sudden destruction, for we know who God is and His will is going to come to pass whether we want it to or not. (Proverbs 3:24-26). Almost to soften Gods power though many like to call the weather we experience as “Mother Nature” or “Old Man Winter”, but only God can cause sudden destruction through weather and His word clearly tells us He will visit us with all manner of weather. In Isaiah we learn how the people of Mount Zion (Gods People) are fought against, but they are not overtaken for the Lord will visit with all types of weather upon those who fight against Jerusalem/Ariel His people! ARIEL=Symbol name in Hebrew for Jerusalem. (Isaiah 29:5-8). Moreover the multitude of thy strangers shall be like small dust, and the multitude of the terrible ones shall be as chaff that passeth away: yea, it shall be at an instant suddenly. Thou shalt be visited of the Lord of hosts with thunder, and with earthquake, and great noise, with storm and tempest, and the flame of devouring fire. And the multitude of all the nations that fight against Ariel, even all that fight against her and her munition, and that distress her, shall be as a dream of a night vision. It shall even be as when an hungry man dreameth, and, behold, he eateth; but he awaketh, and his soul is empty: or as when a thirsty man dreameth, and, behold, he drinketh; but he awaketh, and, behold, he is faint, and his soul hath appetite: so shall the multitude of all the nations be, that fight against mount Zion. As in generation’s past God word stands sure. Just as judgment befell Sodom and Gomorrah as it rained fire and brimstone upon it, so did it pass over Egypt to bring out the children of Israel. Is America seeing His hand passing over it? Be not deceived! Just last week President Obama said America is better today than when he was younger REALLY? Is not what God has said of homosexuality is an abomination in His sight now a law passed as normal activity? (Romans 1:26-32)…. (Leviticus 18:22). And now we must have our school’s set u and labeled for transgender bathrooms. Has God created a transgender person? or has man once again played God to accommodate his sin? God does not make mistakes in His creation! Is it any wonder judgment has begun to pass over the land. Look around at the earthquakes, tornadoes, floods, fires IS GOD NOT showing Himself in the earth? He is longsuffering and wants none to perish, but the day of the Lord is on the horizon……. Are we heeding His signs we were given? (Matthew Chapter 24). When David was delivered from Saul and all his enemies he saw firsthand the power of the living God! (2 Samuel 22:1-17).